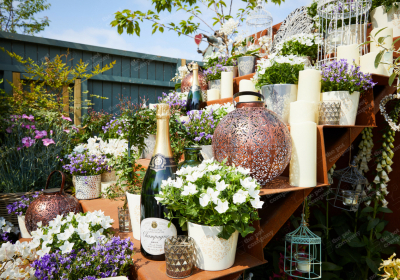 We loved visiting Chelsea Flower Show last week and it was fantastic to see some of our products featured in the show gardens. 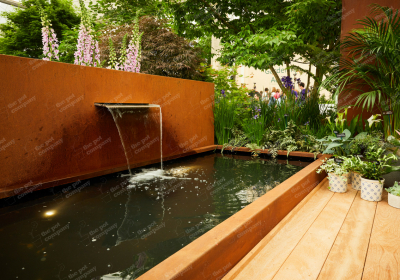 In late Autumn of 2017 we were asked by Hillier to supply the corten steel planters, walls and water features in their show garden designed by Sarah Eberle. We also supplied the corten steel for the Bull Ring Gate entrance they were asked to dress for the occasion, inspired by the Royal wedding, incorporating some bespoke made walls and stairs that made the stage for the installation. 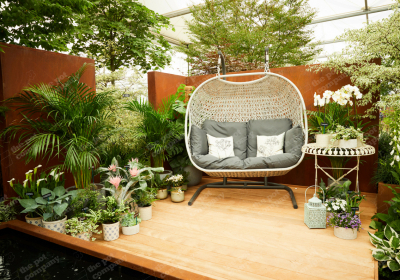 One of the challenges we faced were the bespoke items that needed to be not only fabricated but also weathered to the desired classic corten steel deep ombre colour in time for the setup of the show. For the Bull Ring Entrance, we needed to secure the stairs to the walls, so it would all be self-supporting, this was achieved by having the walls made with blind-welded nuts in the surface of the walls which was also made in a thicker gauge of steel for strength. The stairs could then be offered up to the walls and bolted into place. With all bespoke corten steel orders there was a production time of 6 weeks with a further 2-week delivery time. We worked closely with the setup team at Hillier to guarantee that the steel was delivered on-time and looking perfect, which was achieved with a week to spare! We were also pleased to be able to work with one of our regular clients, Rae Wilkinson. Rae is the designer of one of the ‘Space To Grow’ visitor zone gardens. 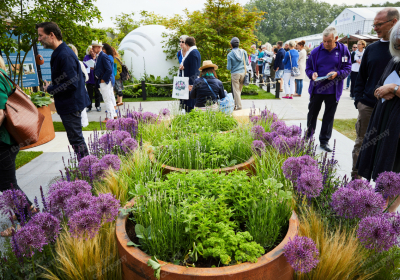 This is a beautiful and relaxing space for visitors to sit, wander around and look at the information screens that present information about the garden category ‘Space to Grow’. 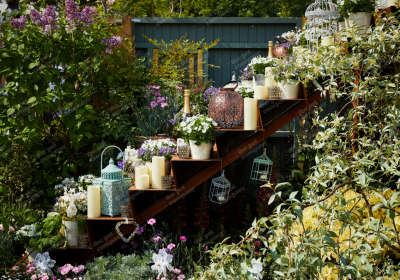 Containerised and ground-level displays demonstrate good planting choices for sun and shade, and there are ideas for planters, as well as other ideas to try at home no matter what size your outdoor space. 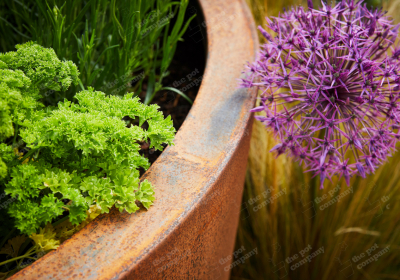 The Corten Steel Atlas planters make exceptionally good herb gardens and raised planters, available in a huge number of size combinations and both with and without bases. 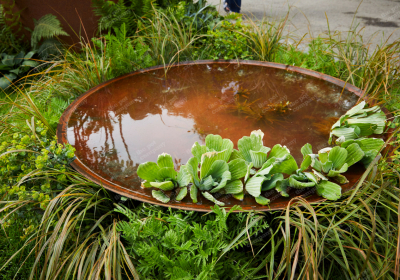 Within the Space To Grow garden there was also one of our 1.2m corten steel water bowls, these ever-popular garden features are perfect for reflecting light into shady areas, such as under trees or creating a little haven for birds and insects. The addition of floating aquatic plants such as the Pistia stratiotes 'Water lettuce' used above help to oxygenate and regulate the pH of the water as well as add a splash of colour too. 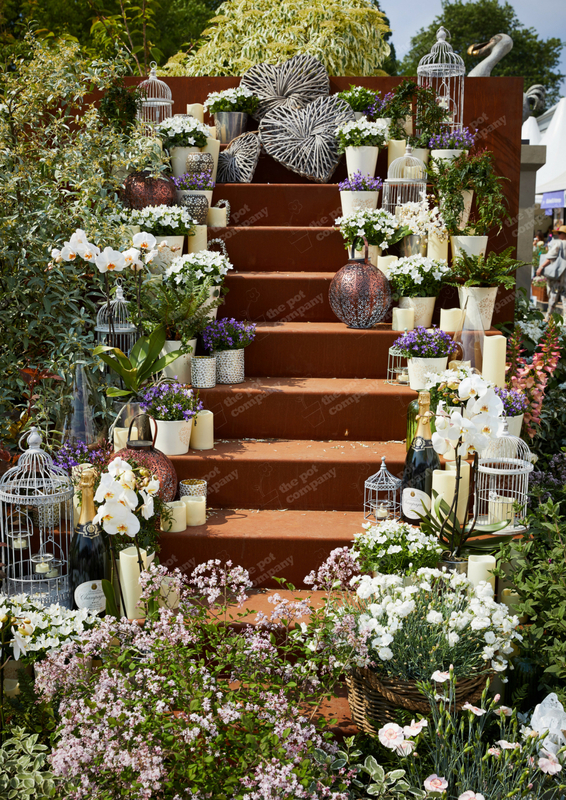 We supplied two of our rustic half-barrel planters for The Trailfinders South African Wine Estate garden designed by Jonathan Snow The winelands of South Africa’s Western Cape are instantly recognisable and strikingly beautiful. This garden is a snapshot of a traditional South African wine estate. 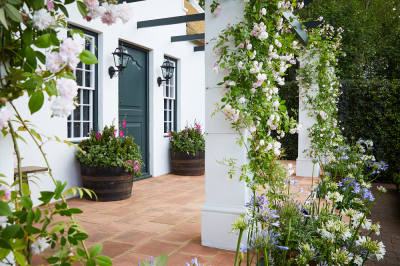 A charming Cape Dutch homestead with a terracotta-tiled terrace leads down steps into a formal, romantic garden, then through a gate to a vineyard. Beyond the vineyard is a representation of the wild and beautiful fynbos landscape. 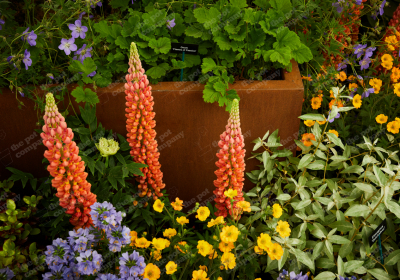 Stewart Landscapes wanted planters that would fit in with the feel of the garden. Made from genuine Irish whiskey barrels, they had the desired aesthetic that was needed for the garden made to look like a wine estate house built in 1761. If you were looking for a cleaner, more modern look we have available full and half French oak wine barrels that will silver with time. 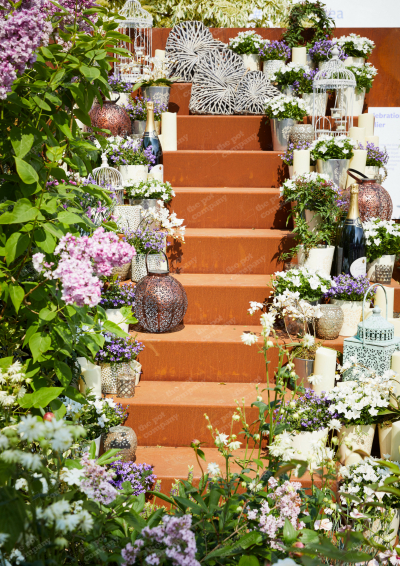 We were very fortunate to have been invited to go to RHS Chelsea this year and were really impressed by all the gardens and exhibits. It was very rewarding to see the finished gardens that we were, in some small way, involved with. 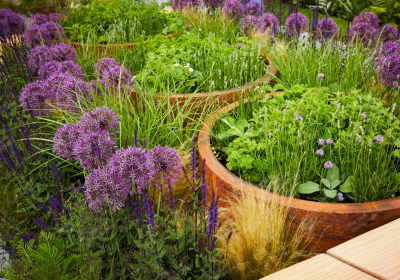 We felt the corten steel used in the Hillier Stihl Inspiration and Rae’s Space To Grow gardens are perfect examples of how the colour of the steel compliments and balances the lush greens of foliage in any garden. We look forward to working with our design partners in 2019!